I finally made bagels! Real boiled bagels! Let me back up. School's out, work's out and I have a house to myself. Add up all those factors and you get, play time! In my terms, that means bake time. I havent made all that much because I dont really eat carbs except on the weekends now and Im only one person. But I have some upcoming projects, fear not! Im growing a sourdough starter so stay tuned for those breads and a couple of other things for tomorrow. Anyway, back to it. I dont know what inspired the bagel choice, maybe it was the fact that I ACTUALLY HAVE A STOVE TOP and could successfully boil bagels, or maybe it was the fact that the Brooklyn girl inside me has not had a bagel in ages. In any case, I was excited to do them right. For that, I turned to my copy of BBA and went for his bagel recipe. When I say it wasnt hard, it really wasnt hard. I made the sponge early afternoon, whipped up the dough in no time, let it rise, shaped them and refrigerated overnight. I didnt run into any glitches over there, I think I kneaded sufficiently and the bagels looked lovely out of the fridge. The only thing I should have done was grease the parchment paper because I had a bit of hard time releasing them. But no major harm done there. 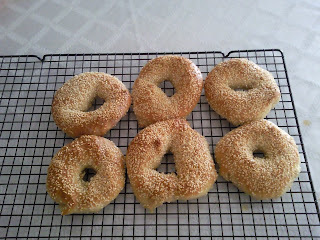 I boiled them in baking soda solution, topped with sesame seeds and baked. Voila! Bagels! 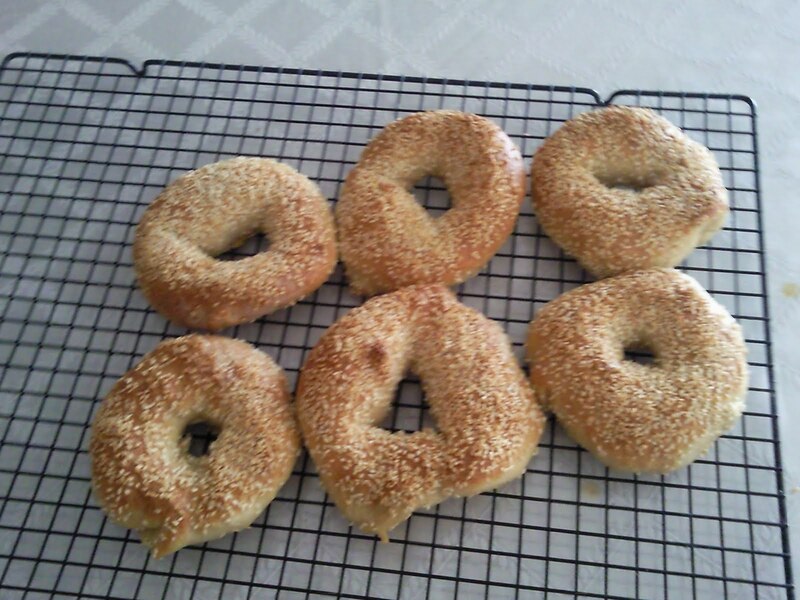 I made half the recipe which gave me six bagels, so five went into the freezer until Shabbat and one went to my friend S, whom I was visiting that day. She was quite excited for that bagel. She declared them chewy and delicious. When I had them on Shabbat they were out of the freezer so they were certainly not as fresh and even textured as they could have been. But they were really good spread with some tahini and tomato, that's how I enjoyed it. I think I would increase the salt a bit in the recipe next time as well. just a note about shaping- I used both the rope and seal method and the poke a hole in the middle method and they both turn out pretty nice looking bagels. Sorry for the lack of photographs. I took pictures the whole way through, but my memory card has had a breakdown and no longer works for me. The camera phone it is! This bread has been Yeastspotted! For the sponge: Combine the sponge ingredients in a bowl and allow to rise for around two hours or until the sponge is on the verge of collapse. When the sponge is ready, add the tsp of yeast and stir until combined. Add salt, sugar and 1 1/2 cups of flour. Mix until a shaggy dough has formed and begin kneading until a dough ball is formed. Slowly incorporate all of the remaining flour until a tacky, smooth, stiff dough has formed. Adjust the water if the dough is too dry. Immediately portion the dough into six pieces and allow to rest for twenty minutes. 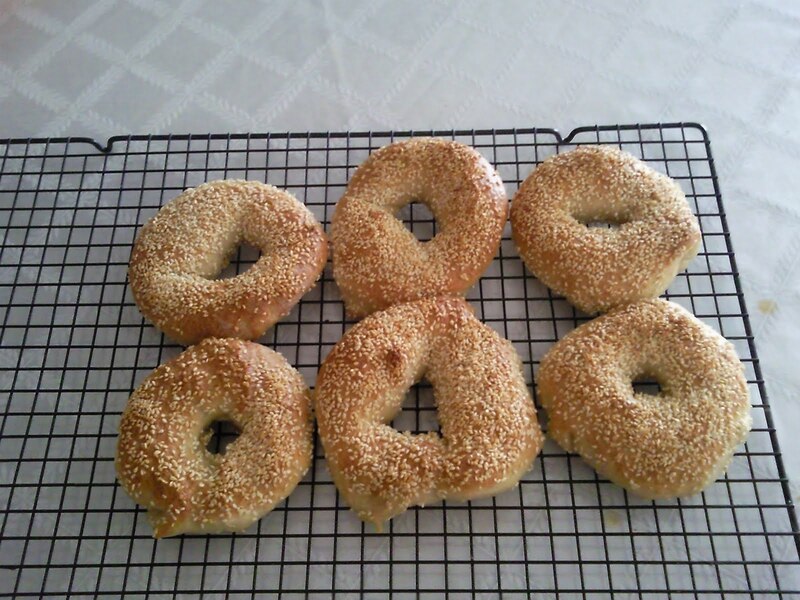 Shape the bagels and place on a greased sheet of parchment on a baking tray. Allow to rest for twenty minutes. Cover with greased plastic wrap and refrigerate overnight. The next day, preheat your oven to 500 degrees. Boil a pot full of water and and about a tbsp of baking soda to it. Drop each bagel into the water and cook for about one minute on each side. 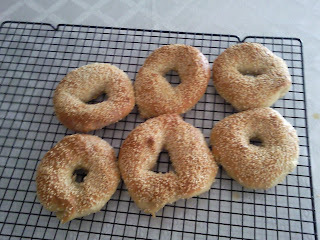 While each bagel is in the water, sprinkle cornmeal onto the sheet where it was to prevent sticking. Once the bagel is on the sheet, sprinkle with the toppings of your choice while they are still wet. Bake for five minutes. Reduce the temperature to 450, rotate the pan and bake an additional five minutes. Remove from the oven and cool for a few minutes before removing to a wire rack. Cool completely and enjoy. Freeze for long term storage.